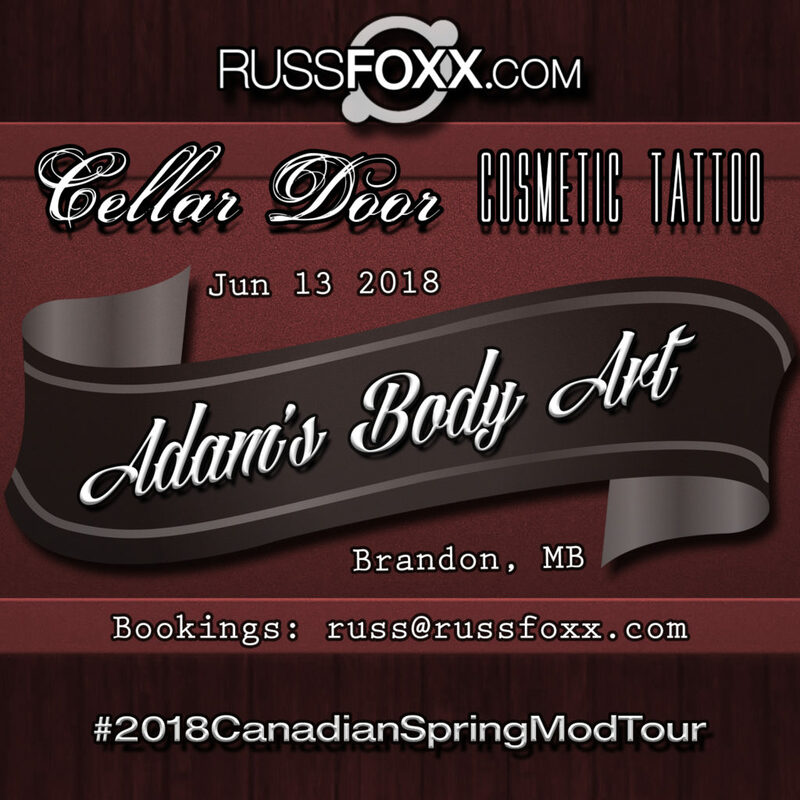 Adam’s Body Art – Brandon, MB Today! Today we are visiting our friends at Adam’s Body Art in Brandon, MB! We are only here for the day, so email us quick if you’d like to be squeezed in for anything! 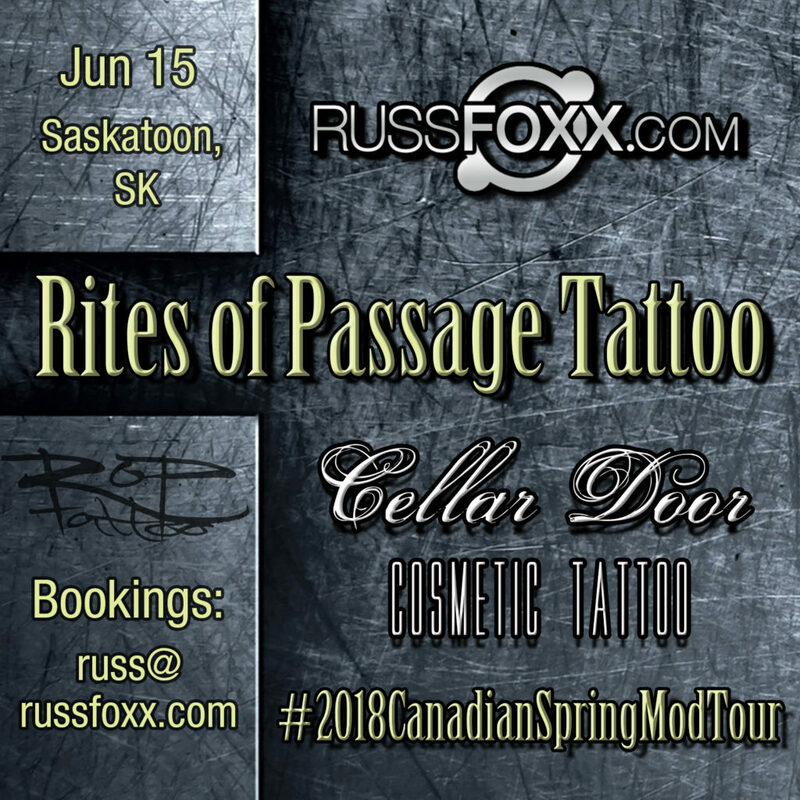 Tonight we head to Regina, SK! 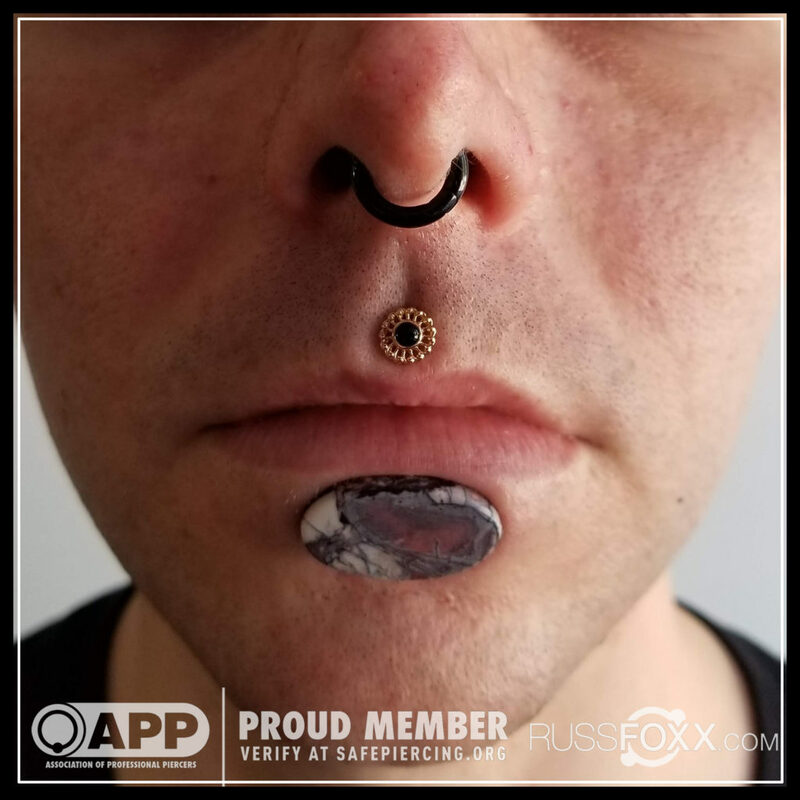 We’re equipped with loads of hand-polished implant grade titanium and niobium as well as 14k and 18k yellow, white & rose gold pieces from the piercing industry’s most sought after jewellery manufacturers such as Anatometal, Neometal, Industrial Strength, Alchemy Adornments, LeRoi, Maria Tash, Infinite Body and more! We’ve got 6 different suspension/modification shirt designs in stock at our discounted tour rate (http://modmerch.bigcartel.com/), as well as a wide variety of 3-D silicone implants manufactured by Steve Haworth. Here is a recent philtrum in which I installed a 14k gold threadless “Thrive” end by Maya Jewelry! Today and Tomorrow: Winnipeg & Brandon, MB! 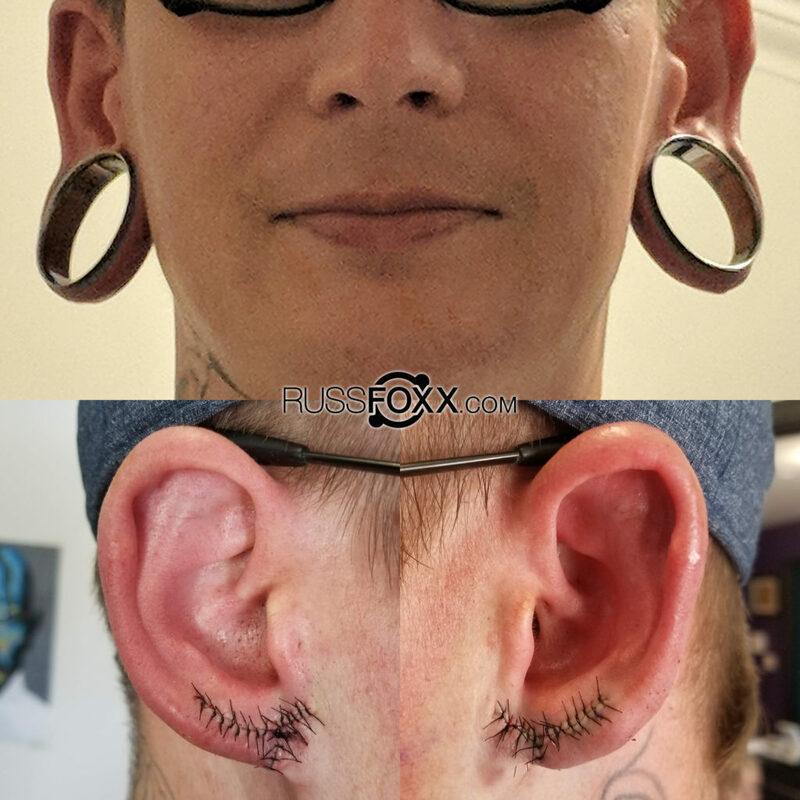 Today we are taking care of piercing/modification/cosmetic tattoo bookings in Winnipeg and tomorrow we will be visiting our friends at Adam’s Body Art in Brandon, MB. Email us quick if you’d like to be squeezed in for anything! Tonight is suspension night in Winnipeg with The RISE Suspension Crew! Tomorrow we are available for modification/piercing/cosmetic tattoo bookings! We’ve got a limited supply of tank tops, tees and tie-dyed baseball tees available at our discounted tour rate, as well as various types of tech implants available. We are also equipped with a wide variety of 3-D silicone implants manufactured by Steve Haworth. Here’s a philtrum I recently decked out with a gorgeous 18k rose gold “Vice” threaded end with black onyx by Anatometal. Thunder Bay Round 2 Today! We made it to Thunder Bay for round 2 today! Tomorrow we head to Winnipeg! We have a little bit of time left this evening for modification/piercing/suspension/cosmetic tattoo bookings, so email us if you’d like in on it! 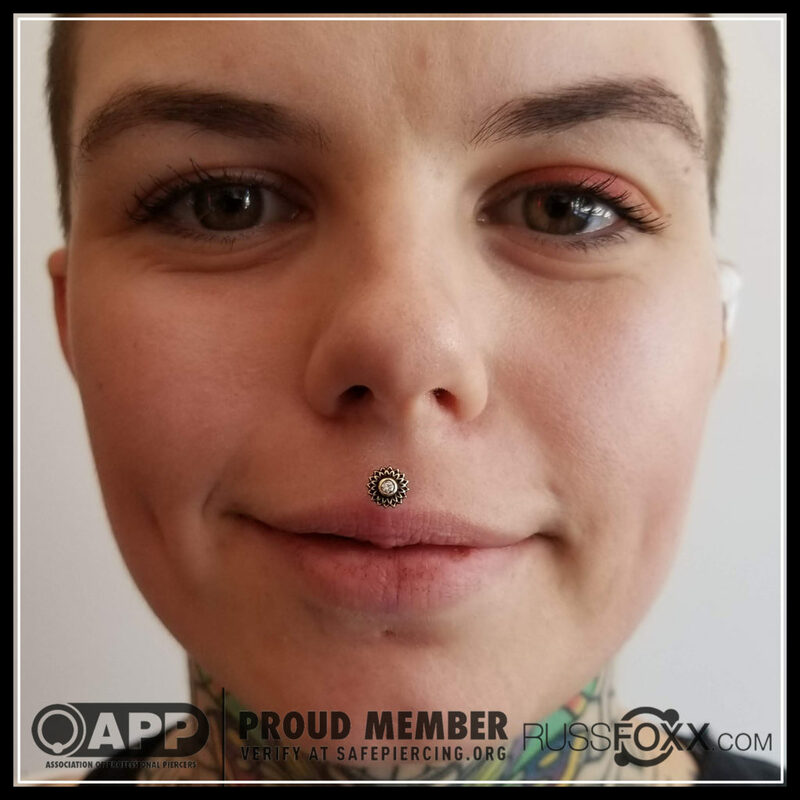 We’re equipped with lots of hand-polished implant grade titanium and niobium as well as 14k and 18k yellow, white & rose gold pieces from the piercing industry’s most sought after jewellery manufacturers such as Anatometal, Neometal, Industrial Strength, Alchemy Adornments, LeRoi, Maria Tash, Infinite Body and more! Here is a fun little “cog” subdermal implant in a scapha from a couple days ago! We had a super fun day today in Toronto wrapping up appts with our friends at Cynik Ink Tattoo Studio followed by a yummy vegan dinner with Will & Ash-lynn at Disgraceland! 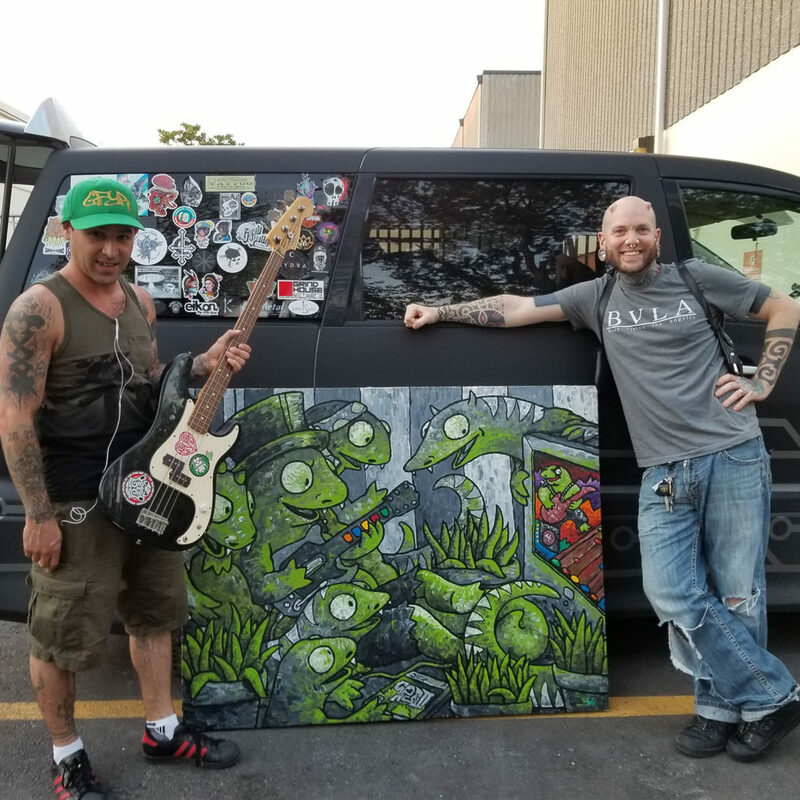 To top that off, Chris met up with us and handed off a couple sentimental items from the late Shannon Larratt including his bass guitar and a huge oil painting he did years ago. This painting is now going to live on our living room wall in Vancouver! Sat Jun 9 we make the long drive North to Thunder Bay. 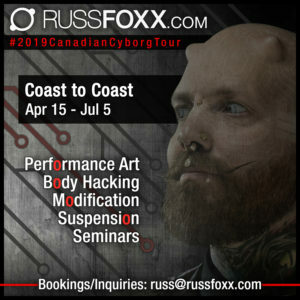 We are available for modification/piercing/suspension/cosmetic tattoo bookings on Jun 10! Email us for bookings and we’ll get back to you as soon as we can! Today is our final day working with our friends at Cynik Ink Tattoo Studio in Toronto! Jun 9 we make the trip North to Thunder Bay! 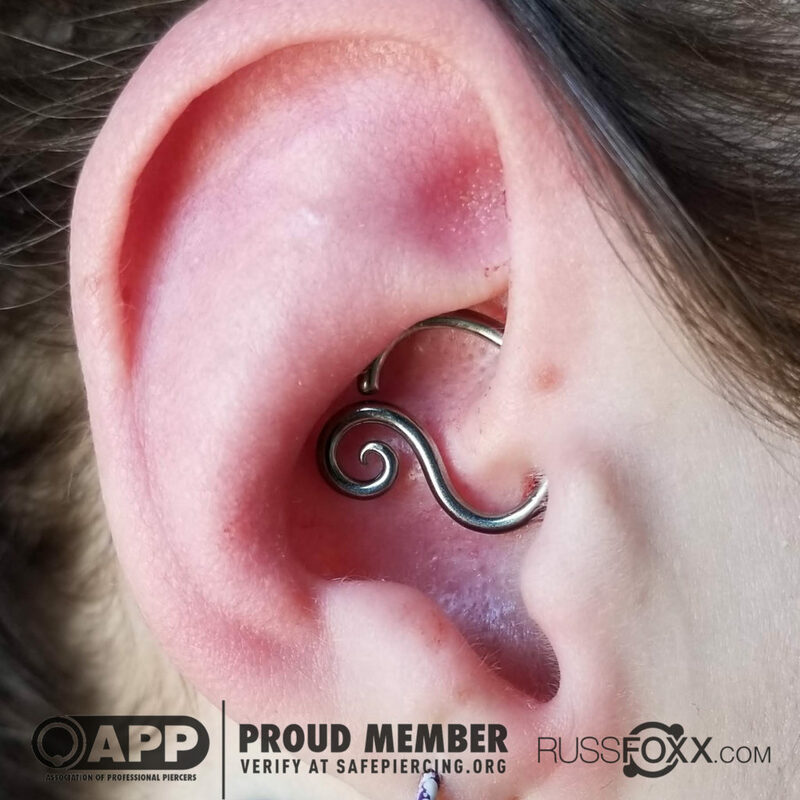 Here’s a neat little daith piercing from the other day w/ custom niobium by Alex at Identity Tattoo and Piercing! 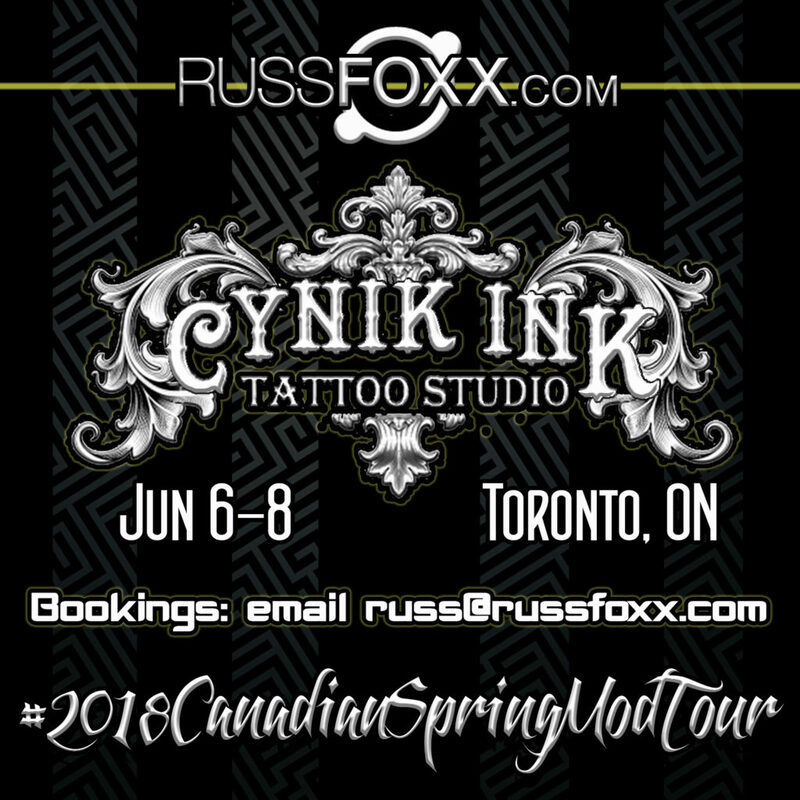 Today is day 2 in Toronto with our friends at Cynik Ink Tattoo Studio! The day is pretty booked up, but I may have time to fit a small appt in around 5:30-6pm. Email me if you’d like to be considered! Limited time left for tomorrow as well. 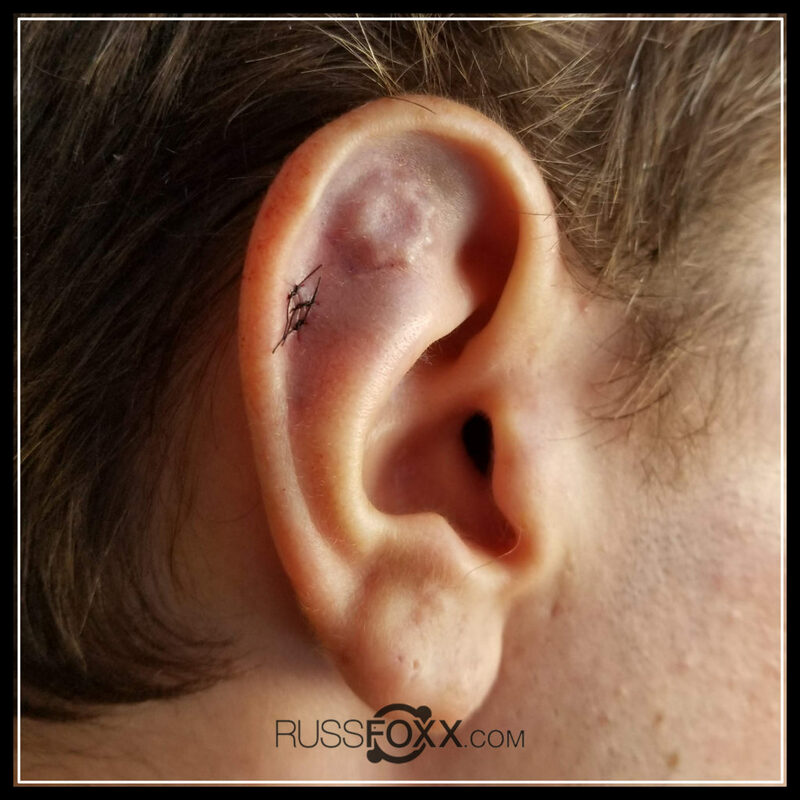 Here is a shot of Julia’s healed power button subdermal implant! Due to overwhelming demand, we are arriving in Toronto a day early to work with our pals at Cynik Ink Tattoo Studio! Come upgrade your old piercing with some new life or get yourself something brand new altogether! We’ve brought hand-polished implant grade titanium and niobium as well as 14k and 18k yellow, white & rose gold pieces from the piercing industry’s most sought after manufacturers such as Anatometal, Neometal, Industrial Strength, Alchemy Adornments, LeRoi, Maria Tash, Infinite Body and more! Today is round 2 in Ottawa! Next stop: Toronto!